Lifestyle, climate and available building materials are major influences in the architectural style of traditional houses anywhere. The Bedouin, nomadic by nature, used to live in animal hide tents during the winter, and arish shelters during the hot summer months. These palm frond shelters were airy in summer, as it allowed for ventilation and were either square or rectangular with flat roofs, or triangular tent-like structures. Palm fronds have also been a commonly used building material in the fishing, pearling and trading settlements on the coast. Barasti or arish houses were built by first constructing wooden frames of mangrove poles, split-palm trunks or any other wood that was available. 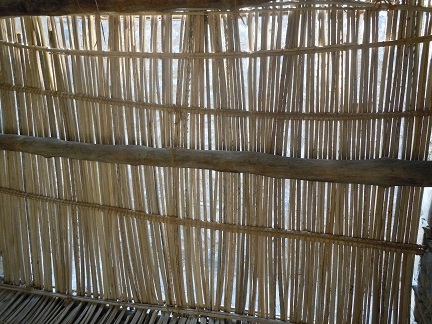 The palm fronds were then used in two different ways: as straight poles with the leaves stripped off for creating screens, and with the leaves still on as roof thatch. Mangrove poles were imported from East Africa and used extensively in the construction of houses made from coral and coral rag (limestone composed of ancient coral material) that were built on the coast by the rich from the late 19th and early 20th centuries. 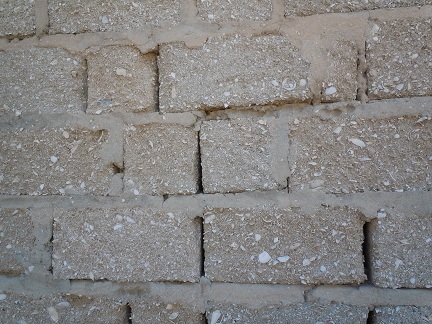 A lime mixture derived from seashells was usually used as mortar, as well as plaster. Mangrove poles were not only used to strengthen the walls, but also as roof beams. These poles had a length of 3.5 metres, which imposed a rigid geometry on these coastal houses. The ceilings resting on the mangrove poles were usually made of planks cut from date palms, while the roofs were flat and thatched with palm fronds. Inland, houses were built from stone gus (mud mixture made into blocks) or stones. 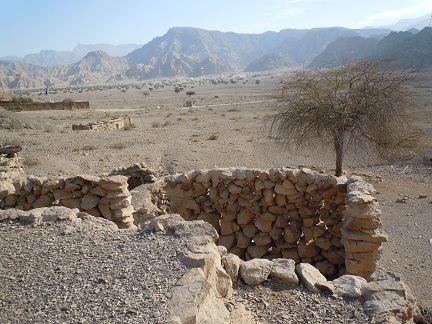 The lower section of these houses consisted of stone blocks or stones to strengthen the buildings and help against erosion. These were bonded together with sarooj mostly made from a blend of Iranian red clay and manure. In the mountains irregular shaped stone blocks were used to construct buildings. 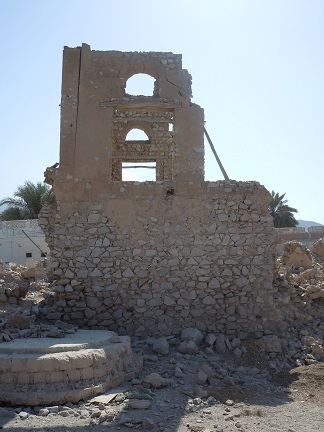 While no mortar were used, the inside walls were plastered with mud, and the flat roofs were covered with palm fronds, wood or mountain bushes. Gravel was also sometimes used for the roof, and as such, these dwellings appeared to melt into the landscape. Although the houses mostly had flat roofs, they could also be pitched. Occasionally built half into the ground, these houses were mostly rectangular, with the odd round one. In an environment with extremely hot and humid summers, ventilation is of the utmost importance. 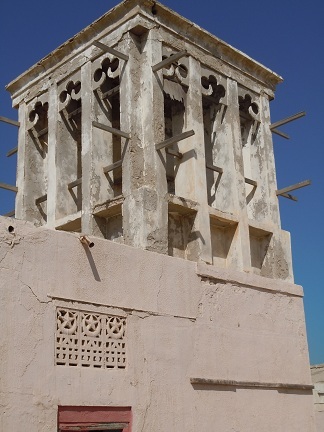 An ingenious design and distinct element that was introduced in the area during the early part of the 20th century were the wind towers or barajils from Iran. These towers encouraged and regulated a downward flow of air and water was sometimes sprinkled at the bottom of the tower to cool down the ambient temperature within the house. Another important influence on the architecture was the Islamic teachings that promote modesty and privacy. Courtyards were the anchoring element, and the living quarters with verandas all opened up onto the interior courtyard, which not only shielded daily activities from outside eyes, but encouraged wind circulation. The exterior walls only had very small openings high up to help with ventilation, and to ensure ultimate privacy. This further enhanced an interior that was shielded from the harsh sunlight, and in combination with the thick walls it created a cool, dark womb-like space. The central courtyard was for the use of the family and cooking facilities were placed to one side. The majlis or meeting rooms where male members of the family entertained their male guests were placed separate from the spaces inhabited by the women so as not to violate their privacy. A wall was often placed immediately behind the entrance gate of a house to prevent passersby a glimpse inside. Decorative details included ornately carved wooden outer doors (an Indian influence), intricate wooden lattice-work on windows and patterns on the walls that were modelled on traditional Islamic designs. 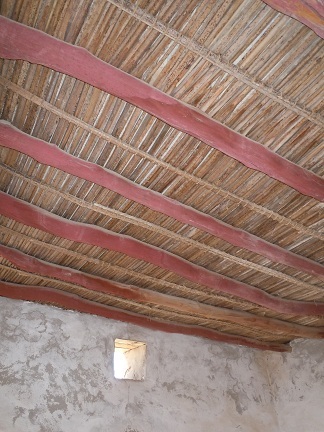 Examples of traditional houses can still be found all over the UAE in various states: from crumbling to newly restored. great article! I can’t believe that they used seashells and coral to build houses, how incredible! Thank you Rosanna. It certainly was clever. Ikr! This is a very interesting article! This is the most useful article, this is even perfect for my multi-cultural wheel! I’m glad you found it interesting, Jason. Please explain what your multi-cultural wheel entails. I’m rather curious. Very interesting! Natives of the Uros Islands are also clever house builders. They make their homes and the islands they float on with totoro reeds. Ingenious, Sue. I love how the use of natural materials found in a specific place are often the best and most effective way of building. Wonderful example of brilliant indigenous architecture. Thanks, Melissa. I love how people always made such effective use of materials available in their surroundings. Me too. It is inspiring. I, too, enjoyed your photo essay on shelters in this difficult climate. I especially appreciate how many different ways date palms are used. There is an Emirati lady who has written in English about what it was like as a child to live in those shelters. The Sand Fish by Maha Gargash. I have other Emirati references if life in that almost impossible climate and landscape before oil interests you. Myself, I can’t explain my attraction to this region–it is such a harsh place to live. Maha Gargash tells it well. I’ve read The Sand Fish, and yes, it is a novel that is excellent in creating a sense of place. If you have any other recommendations, please send them to me. I am not only an avid reader, but like you, have an attraction to this part of the world. I found these quite rich in landscape details–social and natural. From Trucial States to United Arab Emirates by Frauke Heard-Bey. Both were available in good bookstores in Dubai and Abu Dhabi. Thanks so much, Edward. I am definitely going to give all of these a closer look. I appreciate your recommendations. I log on to find how other people live. This was very interesting. The realities of what everyone these days calls ‘sustainability’ are clear in the traditional shelters that you have nicely described above. Thank you for your information. It has helped me in my research. I have a question about the reference to the UAE importing mangrove poles from East Africa in the late 19th Century/ early 20th Century. The UAE currently has mangroves which are now under conservation as they have been dwindling. Because of this I assumed that they were indigenous to the area and would have been abundant during that time. Will you please expand more on this topic? Hi Suzanne. I am glad that you found the information helpful. As I understand it from my research the local mangrove trees did not yield wood that was long enough for the construction of the roofs, hence poles from East Africa were imported, as they were longer and straighter. A fascinating post – really love it. This weekend an artiest showed me scupltures of Spanish, Maroccan and Arabic architecture. HIs work looks wonderful to me. Soon I Will write a blogpost About this subject. I unfortunately do not know any. I suggest you consult Google, Fadel. Maybe they can help with the relevant information you need. really helped me with my homework! you have taken me to old memories of my ancestors home in the village. In the village, I have seen many traditional houses. So glad I could transport you into the past. Bedankt voor de fijne informatie en het volgen van mijn blog. I really enjoyed this post. I just hope that more people will appreciate the traditions of their own architecture. It often takes a long time, and the loss of many buildings before people realize the importance of preserving their heritage. Thank you for this interesting summary, Jolandi. It is fascinating to learn about the various building materials and techniques. I think people everywhere have learned to adapt supremely to their local climate and environment, and used whatever was at their disposal to their best advantage. So true, Tanja. It is always fascinating to see how people have used building materials to suit their specific environment. It is interesting how communities adapt to the environment and become creative for their existence. Nice read and images. I am glad it was helpful, Saffanah. I don’t quite understand your question, Reshma. Also, please note, I am just a blogger interested in the history of the UAE, and not an academic. thanks a lot it helped me in my school project because I actually live in UAE although im filipino so we are studying about the traditional buildings of UAE. I’m glad to hear that it helped you, John. about the traditional buildings of UAE. Glad to hear it was helpful, Joshua. This is helpful for my projects. It sounds like you did quite a bit of research to write this article. Love it. I worked for an architect for a number of years. Lifestyle and climate certainly played a role in how a structure was designed, but building materials? I wonder what would happen if all contemporary architecture was limited to local materials. Fascinating write up. Thank you, Kristin. It took me quite a while to gather the information, so I’m glad that it appears to be quite useful and interesting for many people.